with burnished red and orange-red slip with incised details and eyes in relief. 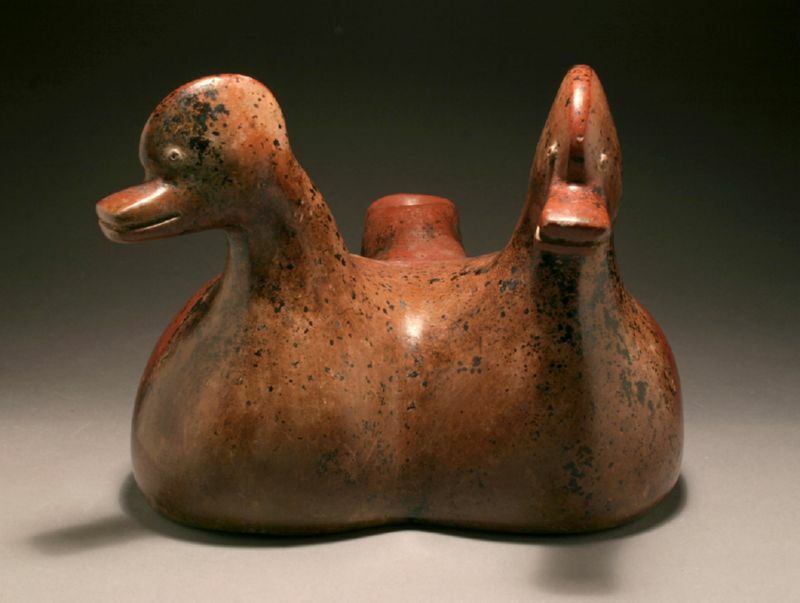 One duck has his head turned to the right, which is a very rare and gracefully desirable occurence in the ancient West Mexican sculptural tradition. Height: 6.5 in. (16.5 cm. ); Width: 7.75 in. (19.7 cm.). Provenance: Acquired from a Private Houston, Texas Collection formed during the 1960s. Comparable: Please see Kan, Meighan & Nicholson, "Sculpture of Ancient West Mexico: Nayarit, Jalisco, Coima, The Proctor Stafford Collection", P. 162, Cat. No. 173, Los Angeles County Museum of Art, 1989.